food: larabars, chickpeas and oil. not together. | eat. drink. fly. food: larabars, chickpeas and oil. not together. hi friends. the last week has been busy which has led to some serious food-time lazies. i did get my homemade larabars done and they are quite a delight. but they are honestly really tasty. and very filling. i’ve been eating one for my mid-morning snack or breakfast and its been keeping me full until lunch. and since making my own was so damn economical, i feel okay with this. i ended up using a base of just dates which i had to do in batches in my new mini food processor. and i used walnuts, almonds and cashews for the nuts. and coconut, natch. and that was basically it. i did add a spoonful or chocolate almond spread just because i had it around and it seemed logical… but also because that stuff is so damn sweet, like eating icing, and i don’t know what to do with it. i wouldn’t add it again. 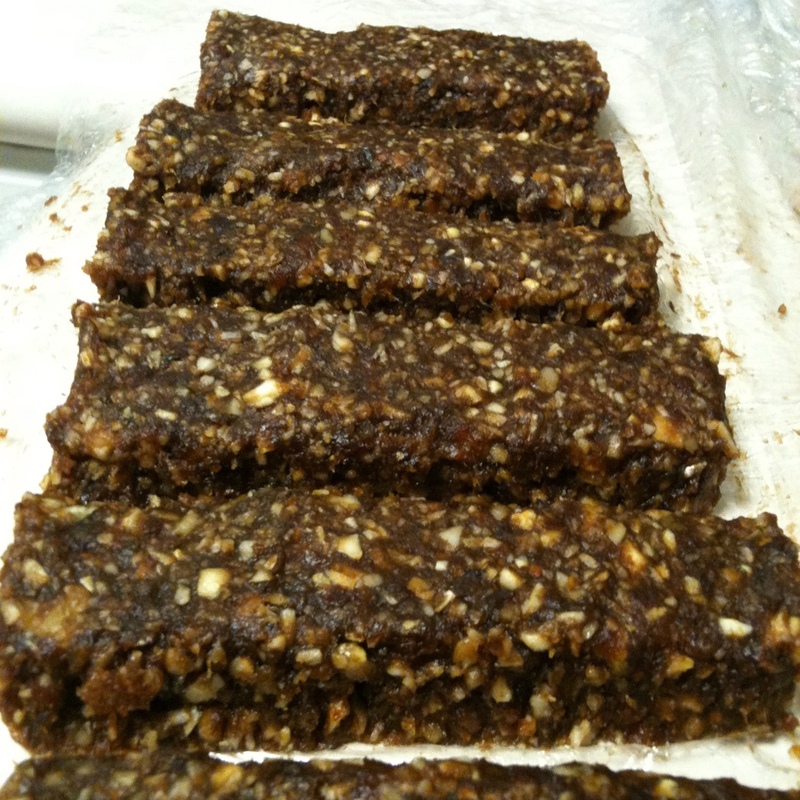 it made the bars crazy sweet and the dates alone add loads of natural sugar. but honestly, i wouldn’t buy that spread again either. so, ya. needless to say, i need to stop shopping at trader joe’s before lunch. but besides that learning lesson, i was damn happy with the results. and this weekend i’ll be making a trader joe’s run and will stock up on other dried fruits to try out some new combinations. 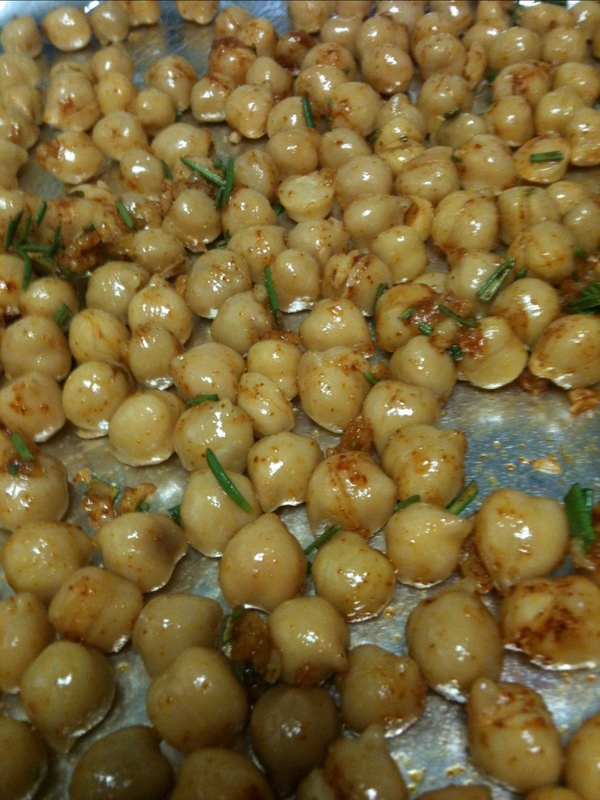 my other culinary adventure this week was roasted chickpeas. this was born of some late night munchies and the absence of popcorn which would normally fill this void. anyways, i wanted a snacky salty carb. and right now, the pickin’s are pretty slim for that in my house. i finally came up with the idea to roast the can of chickpeas. i knew i’d seen it online somewhere, so i did a quick google and came up with some ideas and a temperature guide. i drained and rinsed the chickpeas and dried them off. then i tossed them in olive oil, fresh garlic, rosemary, paprika and sea salt. and then roasted them for about 20 minutes at 400.
they turned out pretty delicious, but the garlic & most of the rosemary burned. after some further google research, it seems that a lot of people will dry roast them and then toss them in an oil/butter/herb/whatever mixture after they’re cooked to avoid this issue. next time i’ll try that. but, at the end of it all, my salty carby snack was achieved and all was well with the universe. the absence of carby snacks is my paleo downfall. but, i figured that somehow, eating a chickpea seems better than eating a corn chip. and i stand by my logic. i read a really interesting and scary article about eating vegetable oil last week and its stuck with me. this article was very WOW for me. it’s long, but it’s very thorough and i appreciated that. it sites real references and just plain made sense to me. it also made me go to my fridge and assess exactly how many products we own with vegetable oil in them. because we don’t buy bottled salad dressings, thats not a worry… but we do use mayonnaise. and there’s a few sauces & such that we have in the fridge that contain vegetable oils. so my project for this upcoming week is going to be making my own mayo and seeing how we like it. my husband uses mayo on his daily sandwich, so he gets to make the ultimate decision, but he was down to ditch the veg oils too if possible. it seems that i can make mayo out of any oil, but olive oil is the most common choice… so that will probably be my first try. but i do have this lovely hemp oil that has a great grassy flavour… and my walnut oil might make a nice add in too. so i’ve got some ideas. i’ll try this mayo thing and report back. which is filling the void until this KitchenAid architect series food processor magically shows up in my kitchen. sooooo… if anyone can make that happen, that would be super…. Looks very good, such a creative recipe! Aren’t there pre-made mayo options made with olive oil? I swear I’ve seen it on shelves but didn’t bother to pick it up to look at ingredients. they exist, but all the ones i’ve looked at include olive oil, but still contain vegetable oils.